The men of Duck Dynasty have been turned into some fantastic talking wacky wobblers! 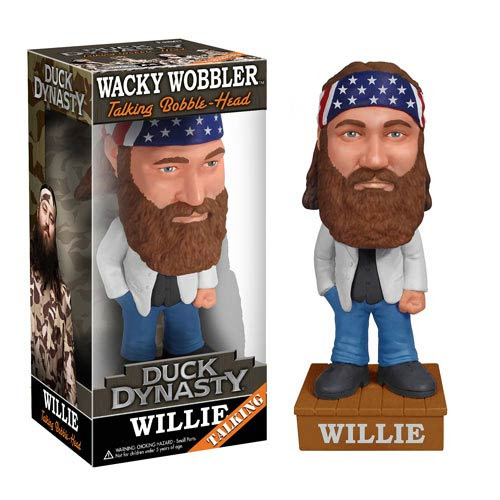 This Duck Dynasty Willie Robertson Talking Bobble Head features the CEO of Duck Commander and member of the Robertson family in wonderful talking bobbler form. Measuring 7 1/2-inches tall, this fantastic guy will look great on your desk at home or at the office and will help keep you entertained during those slow parts of the day! Ages 5 and up. "Let me tell you about redneck logic... Just blow it up! He's gonna be so enamored with the fire. Whoo he'll forget all about what he's losing." "Boom! That's what I'm talkin' about." "I'm about to go crazy redneck up in here. Yee-haw."